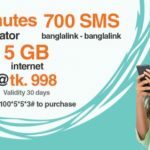 Welcome to all Bangladeshi telecom users to know about the Banglalink Mobile Number Portability Service in Bangladesh. It is the most important and new service for all subscribers. Now all users can change her operator with the same number. The much-awaited mobile number portability (MNP) service will be launched today on a trial basis. The service will roll out at zero hours, said Md Jahirul Haque, acting chairman of Bangladesh Telecommunication Regulatory Commission (BTRC). Bangladesh will be the 72nd country to launch the service. Customers will be charged Tk 50 as well as a 15 percent value-added tax to change carriers within 72 hours. To do so within 24 hours, another Tk 100 has to be paid. Both require a visit to the new operator’s customer care center. Buy 1GB at Tk.33 as many times as you want within first 90 days from activating your SIM. Buy through Tk.33 recharge or USSD *132*033#. To check your 1GB Free Internet Balance dial *124*5#. The validity of 1GB @ Tk.33 pack is 7 days. To check 1GB @ Tk.33 pack Internet Balance by dial *124*300#. You can buy Tk.33 pack by either recharge or dialing USSD *132*033#. 1GB @ Tk.33 can be bought as many times as you want within the first 90 days of activation. New connections will get Pre-loaded Tk. 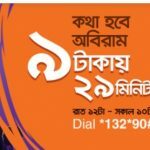 5 balance, valid for 15 days and can be used for any Banglalink service. To check the main account balance, dial *124#. Finally, we hope that all customers have got more information to know about the Banglalink Mobile Number Portability Service in Bangladesh. If you want to know more or faced any problem, just comment the box.